Forsyth Tech’s team of nanotech students placed first in the National Science Foundation’s 2016 Community College Innovation Challenge (CCIC). Team members include (l to r) Jack Landgraf, Philip York, Shannon Coalson, Adam Afifi and nanotechnology instructor, Dr. Mehrdad Tajkarimi. "(Winston-Salem, NC) – The National Science Foundation (NSF) announced late this afternoon that a panel of expert judges selected Forsyth Technical Community College’s team of nanotechnology students as first place winners in the 2016 Community College Innovation Challenge (CCIC). The students’ innovative approach to applying nanotechnology to maximize the efficiency of greenhouses through solar energy elevated them to the national championship. Normandale Community College in Minnesota and Virginia Western Community College in Virginia tied for second place. Forsyth Tech’s team included Shannon Coalson, Adam Afifi, Jack Landgraf and Philip York. 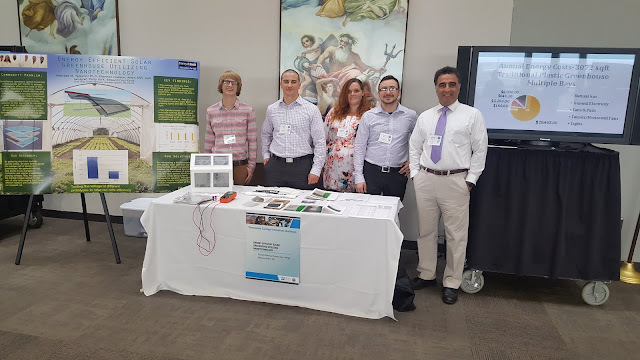 They were selected from among 10 finalist teams across the country that participated in a rigorous multi-month process requiring them to develop innovative, research-based solutions to challenges at the nexus of food, energy and water systems. The 10 teams spent this week attending a four-day innovation “boot camp” in Arlington, VA during which they received feedback on their presentations and met with experts on subjects including team-based design, communicating the value of innovation and transitioning research to commercialization. The boot camp included a visit to the U.S. Capitol yesterday where teams had the chance to present their projects to members of Congress and legislative staff. The Forsyth Tech team’s innovation addressed modernizing today’s greenhouses to fit individual customer needs by incorporating the use of renewable, cost-efficient energy sources through the use of nanotechnology. “This national distinction places a tremendous shining star on our nanotech students’ résumés,” says Michael Ayers, dean of Math, Science, & Technologies. “It validates the type of innovative programming that Forsyth Tech offers, which few other colleges across the country can match. The NSF, in partnership with the American Association of Community Colleges (AACC), developed the CCIC competition as a way to foster development of crucial innovation skills among students in one of the nation’s most significant academic sectors. Community colleges play an important role in developing America’s technical workforce, in part by involving groups traditionally underrepresented in science, technology, engineering and mathematics (STEM) education and careers. Forsyth Tech provides students with flexible educational pathways to a competitive workforce for the community and global economy. The college offers associate degrees, diplomas, and certificates in more than 200 programs of study, including programs that promote personal and professional development through non-credit courses and seminars, as well as customized training for business and industry. Forsyth Tech is the fifth largest community college in North Carolina and serves more than 35,000 students with approximately 1,500 full and part-time faculty and staff."